We source quality leather material and utilize eco-friendly production tailored for perfection. Your creation is handcrafted by our team of passionate leather craftsman. We strive to live up both our high standards and your high expectations. 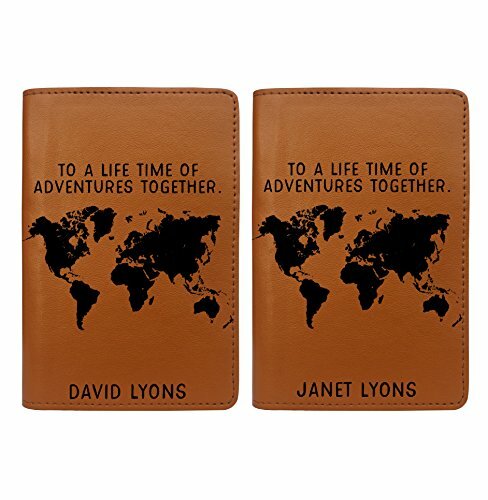 PERSONALIZED: All passport covers are handmade to-order, just for you! Make it uniquely yours by adding your INITIALS or NAME to your passport cover by clicking on 'CUSTOMIZE NOW' and adding your text in the 'NAME BOX'. SIZE: Perfect fit for all common size passports. Designed to hold USA, EU, CHINA, AUSTRALIA, CANADA passports, and many more! 100% HANDMADE: The personalized leather passport covers are made of fine, soft eco friendly leather. We created them to bring inspiration and esthetic pleasure for all travelers around the world. The interior features a sleeve for your passport and holds up to (4) slots to store your credit cards. All our passport covers are hand cut, double stitched, and hand sewn by skillful leather craftsman to last for years! STAY SECURE: Organize your travel essentials better. This minimal design keeps the clutter down while remaining thin and sleek.Stand out from the crowd and keep your RFID Passport safe and protected. This is a gift that will be used and loved for a lifetime! Perfect for the jetsetter in your life! HAPPINESS GUARANTEE: Here at Handmade by Julie, we are proud to offer top quality material at affordable prices. We have a 100% happiness guarantee. Meaning if for any reason you are not satisified with your order, we would be happy to assist you on replacing your item or fixing it for you. If you have any questions about this product by With Love From Julie, contact us by completing and submitting the form below. If you are looking for a specif part number, please include it with your message.